Every January, the number of 24 Hour Fitness, Lifetime Fitness and Gold’s Gym commercials skyrocket, as people make their fitness New Year’s resolutions. If you made a commitment to become healthier in 2013, or you just want to get out there and be more active, we’ve made a list of of places in Central Texas to help you to achieve these goals while enjoying the out-of-doors, and supporting local business. One of the great things about living in Central Texas is the number of places for being active outside, including several nearby state parks and natural areas. One, west of Kyle, is Enchanted Rock, the enormous pink granite dome 15 miles north of Fredericksburg that is steeped in Native American mysticism and lore. 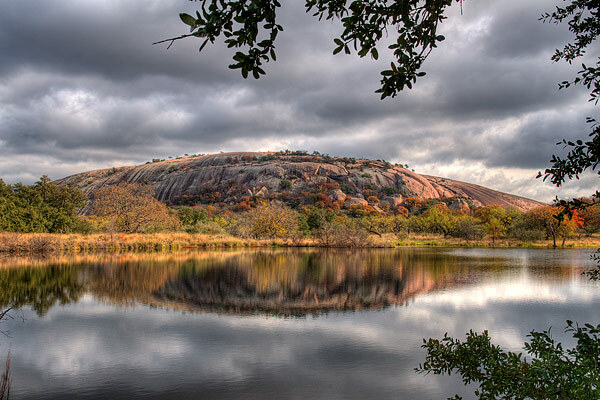 The rock formation itself is surrounded by the Enchanted Rock State Natural Area which features miles of hiking trails, campgrounds, as well as spaces for picnicking and technical rock climbing. The Summit Trail is one of the most popular hiking paths, which leads to the top of the dome and offers panoramic views of the surrounding countryside. The three-quarter mile trail is relatively short, but the 800 foot climb up the structure can be strenuous – so come prepared. 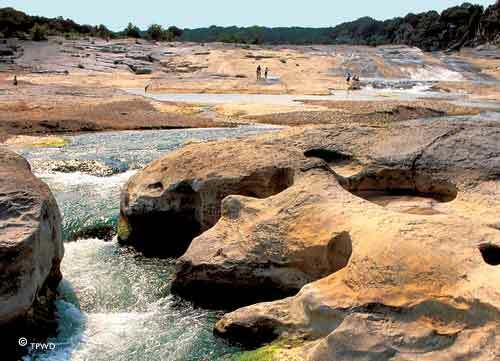 Also located west of Kyle is the Pedernales Fall State Park. Most of Pedernales’ activities are water related – and therefore more suited to warmer weather – but the park is also a favorite for family hikes – with a duck pond, a quarter-mile nature trail to a scenic overlook of Twin Falls, and a wheelchair-friendly wildlife-viewing station. The park also features a beautiful 7-mile trail that wraps around the Tobacco and Wolf Mountains, and the small canyons created by the Mescal and Tobacco creeks, so you can enjoy the scenic beauty of the Hill Country while getting your workout on. East ways, the Bastrop State Park also provides opportunities for backpacking, camping, canoeing, and viewing wildlife, as well as hiking and biking. In fact, a 12-mile scenic bike route between Bastrop and Buescher State Parks takes you along Park Road 1C, through the mesmerizing Lost Pines of East Central Texas. This winding and hilly trail is actually a part of the MS-150, too, the famed annual bike race from Houston to Austin. Other great locations for bicycling around Central Texas abound. AustinBike.com is a great resource for those interested in mountain biking, as the group travels around the area, testing out and reviewing mountain bike hot spots. Two such spots include the Madrone Trail in Canyon Lake and Rocky Hill Ranch in Smithville. 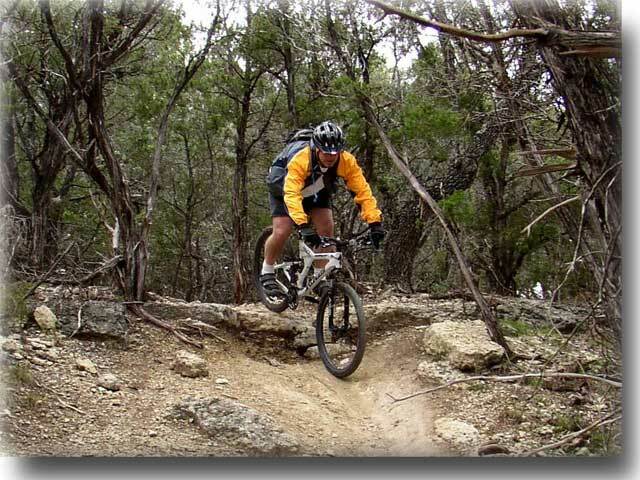 The Madrone Trail takes bikers on an 8.4 mile loop along the scenic areas around Canyon Lake’s, well, lake! It’s ranked a “medium” as far as difficulty goes, and there is a wide variety of trails available, making for a fast ride with lots of twists and turns. Rocky Hill Ranch offers a variety of trail options in Smithville, too. The main loop is about 16 miles long and takes you through trails to ledges, short climbs, twists, turns and bunny hops over logs and more. To top it off, the trail ends at The Rocky Hill Café, which offers burgers, fries and ice cold beer to reward you after the ride. Can’t ask for much more than that, eh? If street riding is more your thing, there are a number of bike riding resources available from those up in Austin. Bike lanes are everywhere up there, and BicycleAustin.com even offers a route from Austin through San Marcos all the way to San Antonio. If this cooler, winter weather has deterred you from outdoor activities, indoor fitness opportunities are everywhere, too. 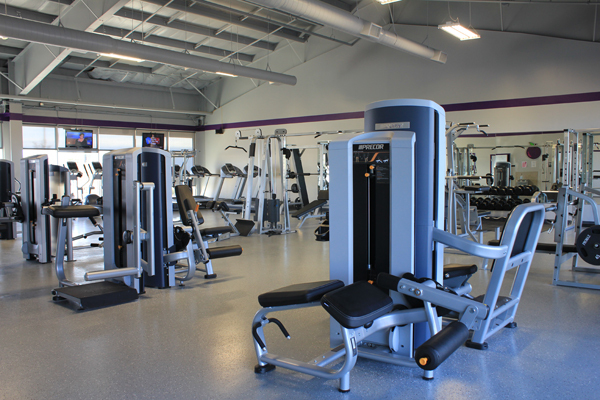 Plum Fit is a 24-hour, key-card controlled fitness facility located in Plum Creek that provides local residents with a wide variety of fitness opportunities, including cardio and weight machines available at any hour of the day. And the City of Kyle is offering fitness programs for Kyle residents this year, contracted through Live Well personal training. These programs include indoor and outdoor bootcamps, walking and running training, as well as Pilates and Yoga classes. So, as you’re embarking on your 2013 health and fitness agenda, keep in mind the wonderful indoor and outdoor opportunities available in Central Texas. There’s so much more out there than the big, corporate gyms, so explore the area and support local business! The holidays are a stressful time of year – with gifts and holiday meals, dealing with the in-laws, and putting up all those Christmas lights and decorations. That’s a lot of pressure. In the midst – or after – the holiday frenzy, be sure to devote some time to yourself to relax and unwind. You deserve it. And there are a number of places and things to do in and around Kyle to help you de-stress. In San Marcos, escape the hustle and bustle of everyday life in your own private spa at Sink Creek Day Spa & Retreat. The facility offers a custom four-guest Jacuzzi tucked in the shade of the trees surrounding the spa, a Dry Finnish Sauna, a treatment room with art and antiques, and a cozy library filled with relaxing reads. Sink Creek offers 45-90 minute massages that come with the complimentary use of the facility’s hot tub or sauna, as well as massage packages that can be used multiple times over the course of the year after purchase. The spa also offers facials, paraffin wax hand dips, and spa treatment services such as aromatherapy and hot stones. They book appointments 7 days and they also offer gift certificates. If you want to make a day of it, Sink Creek also provides a list of their favorite spots in and around San Marcos, so you can eat and have some fun before or after your spa experience. Further away from Kyle, in Fredericksburg, The Back Forty of Fredericksburg offers 40 acres of serenity, away from anything remotely stressful. The bed and breakfast spa / ranch offers a wide array of services including private breakfasts, massages and facials in their European day spa, an herb garden patio, cozy outdoor fireplaces, fly fishing instruction, and the availability of a boat. Located at the edge of Fredericksburg along Baron’s Creek, the spa and ranch is the perfect place to hide away, amidst the trees, the water and the pastoral animals of the Central Texas Hill Country. The spa offers two or five day stays, with a variety of services and amenities available with each package. And, if you purchase a two-day Christmas gift certificate as a gift for the holidays, you get another one for yourself! Not a bad deal, eh? Closer to home (and FREE) is Lake Kyle, one of the city’s most serene places to sit down and take a break. Lake Kyle officially opened in the spring of this year, and the first phase of construction was completed in October. These construction updates included the completion of a fishing pier, multiple nooks for fishing from the shoreline, a covered pavilion, an amphitheater, a children’s playscape, picnic tables and the Parks and Recreation department’s official headquarters. Head to the lake early in the morning for some quality bass, catfish or perch fishing, or a stroll along one of the lake’s four nature trails for some peace and quiet in nature. Hundreds of oaks, magnolias, crepe myrtles and sycamores have been planted around the lake, and each of the nature trails offer the perfect showcase of the lake’s surroundings, from the nature preserve, to the dam, to the north shore’s fishing nooks and the wildflower meadow. This winter, Lake Kyle is open from 8 a.m. to 5 p.m. Monday through Saturday, so take a moment away from the holiday buzz to clear your mind and enjoy the natural beauty we have here in town. 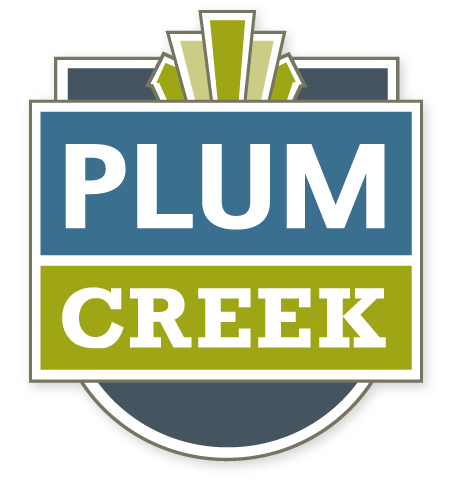 For those with half an hour or less to spare in between gift wrap and preparing the turkey, Plum Creek’s own fishing lake and hike and bike trails offer a quick and convenient reprieve from the stress, just beyond your doorstep. Also within the development is the Plum Creek Golf Course, which offers 200 acres of beautiful Texas Hill Country terrain for your golf game. Or, you could always crack open a bottle of wine and sit on your front porch to watch the sun set and enjoy some peace and quiet this holiday season. While malls and departments stores have been ready for the holidays since Halloween, Thanksgiving has passed and the holiday season has officially begun. Starting this weekend, cities and towns from across Central Texas are gearing up for the holidays with lights, events and festivities throughout the month of December. To help make your holiday season as festive as possible, we’ve compiled a partial list of events and celebrations happening in the area. This weekend, Buda’s annual Budafest takes place from 10 a.m. to dusk, December 1-2nd. The 33rd annual celebration will feature an array of fun, family friendly events including live music, over 125 craft vendors, a wide selection of locally-prepared food and a carnival for the kids. The event takes place at Buda City Park and will begin at 10 a.m. on Saturday with a holiday parade starting from the Fire Station. November 28th to December 1st, San Marcos hosts their four-day Sights & Sounds of Christmas celebration south of Kyle. Festivities include arts and crafts, a carnival, food vendors, a 5K & 1K Run a parade along downtown Main Street hosted by the San Marcos Citizen Police Academy Alumni Association, and live music performances each night. Tickets to the event are $4 per night, or $7 for the complete four days. For more information about the event, including a performance schedule and event details, visit the Sights & Sounds of Christmas website. Throughout the month of December, San Marcos will also host Santa’s Ranch – a mile of spectacular holiday scenes featuring over 1 million lights and 100 displays and animations. Other holiday light scenes can be found in towns throughout Central Texas thanks to the Texas Hill Country Regional Christmas Tree Lighting Trail. Eleven communities are participating in this year’s event with light displays and special festivities occurring throughout the month. Special events and features a self-guided, winter wonderland walk amidst 2 million lights reflecting on the waters of Lake Marble Falls; a German-themed Christmas tree, holiday lights and an outdoor ice skating in Fredericksburg; and a Cowboy Christmas at Enchanted Springs Ranch in Boerne, December 22-23rd. For a complete list of participating communities, and more information about each city’s festivities, visit the Texas Hill Country Christmas Trail website. Other holiday events in the area include a capella caroling inside the Cave Without a Name in Boerne December 8th, ice skating atop Whole Foods Market in Austin, Polar Express Movie Night under the stars in New Braunfels, and an endless array of holiday craft and vendor markets in towns across the area. So, when you catch a minute between shopping, decorating, cooking and cleaning for the holidays, take some time to enjoy the spirit of the season with some lights and family fun in Central Texas. Ice cream is putting the squeeze on cupcakes. The No. 1 Dessert title now belongs to the frozen, creamy treat. And people are beginning to notice and experiment. The classic vanilla, chocolate and strawberry flavors (while still delish) are being replaced by tastes with a twist: balsamic strawberry, peppered bacon and spicy dark chocolate. But we don’t discriminate. Old school or new, we love ‘em all. And we’ve found the best places to indulge your taste buds that are just a hop, skip and jump away. Don’t be thrown off by the fact that Likkity’s serves frozen custard; it’s just as good – some say better – than traditional ice cream or soft serve. Likkity’s keeps it simple and offers vanilla and chocolate flavors to be fancified with your choice of candy, nuts, sauces and other mix-ins. Owned by Michigan transplants who were appalled by the lack of frozen custard eateries in Texas, Likkity’s is a great stop for those passing through south Austin. Avocado. Goat cheese and honey. Corn. No, this isn’t a recipe for a stellar party dip. These are just a few of the flavors that ice cream-maker Rhea offers at her San Marcos shop. Tucked into a small, narrow store on North LBJ, Rhea’s Ice Cream also provides a cool – if not small – reprieve from the heat. Bright, vintage touches offer patrons eye candy as they nosh their slowly melting fare. And if you happen to catch Rhea behind the counter, be prepared for a conversation just as sweet and enjoyable as the ice cream itself. Locally owned and operated, Chill Out is a gem among yogurt and ice cream offerings in Kyle. The self-serve yogurt bar opened just over a year ago. Non-fat and low-fat yogurts line the walls, beckoning patrons to their shiny, condensation-laden levers. Our favorite, you ask? Dulce de leche. Thick, creamy and not too sweet. Top that with waffle cone bits and heath bar. Located in the Target shopping center, this spot provides a nice break from a shopping-filled Saturday. We’ve even heard of Texas State University students camping out for long study group sessions – and we whole-heartedly approve. Don’t blame us if you find yourself in a goodness-induced coma; most likely because we’ll be in one, too! “Just a few minutes south of Kyle on I-35 at the Yarrington Road exit behind the Hyundai dealership is Thunder Hill Raceway where our 14 y.o. son, Matt, races his Allison Legacy race car on many Saturday nights. The track has several different series of race cars that race. They also have bicycle races on the track for kids, kiddie rides in the pace car, driver’s autograph booth, kid’s activities, lots of food and a good time for all ages. Check their website for various special events like Crashfest, cars jumping off ramps, and many other specialties. You’ll never be disappointed in the races as there’s always spins, crashes, thrills, and fast cars! Gates open at 4 p.m., qualifying starts at 4:15 p.m. and festivities start at 6 p.m. and are finished by 10 p.m. Be sure to bring ear plugs! Thunderhill Raceway, opened in 1998, is a 3/8 mile, D-shaped track that typically runs on the second and fourth Saturday of the month. Thunderhill is sanctioned by ASA Racing.